My fellow designer, Jake Birkett, has placed a post-mortem for our GGJ project on his blog. His post is a bit more lengthy than mine, but check it out for a nice summary of our jamming experience. This was created by a team of 5 over the course of the 48 hour event. Click on the crown in the game menu for detailed credits of the team involved. We ran out of time for a tutorial so the quick tutorial I’ll give you here (we told the participants at the jam this). 3. 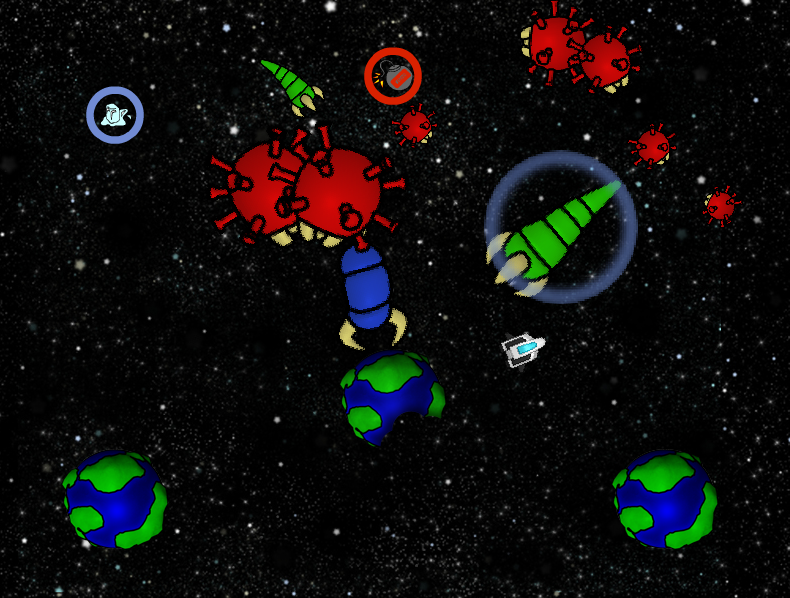 Use the power ups on the bacteria by flying into the bacteria. Each one does different things! 4. Look out though! The Bacteria are each immune to certain weapons. 5. Protect all 3 of your planets as long as possible! 1. We were definitely looking at refining any progression in the game so people would be more comfortable with it. To do that I would look at making the first few “waves” of enemies go through the three different enemies and weapons one by one, followed by giving the player the weapons that the enemies are immune to. Players can do it on their own now, but making sure it’s clear early on would be a nice gift to the player. 2. Add a scoring system so that players can compare scores, keep track of their progress, and try and do better next time. 3. Refine the feedback to players. We added a few things such as sounds and visual effect rings to let players know when they flew into bacteria, etc. but occasional players mentioned they would like more feedback in some regard. So making the feedback more effective would have been useful. The Global Game Jam 2011 was last weekend and it was great! We had over 100 jammers at our location and made some great games over the 48 hours. We had not only one keynote speaker (the global one by Keita Takahashi, maker of Katamari) but three! In addition to Keita’s recorded video, we had Scott Jones of “Reviews on the Run” and Kelly Zmak the former President of Radical Entertainment. After the keynote we were given various icebreakers to meet other people. Then we were told the theme (this year it was Extinction!) and broke into teams to brainstorm game ideas based off of the theme. We had over 20 people pitch the best game ideas and then people joined the teams to make the games pitched (or formed new ones if none of the games were what they were looking for). I was fortunate enough to work with Jake Birkett and Alex Vostrov, two experienced indie game designers, and two great artists. Together we put together a game called “The Invasion of Giant Planet-Eating Bacteria From Outer Space”. It was a good game, but we felt a tutorial would’ve helped. Alas, in 48 hours time is very limited so we generally told people the tutorial over their shoulder.